PRODUCT: Protecto Wrap BT-25XL Butyl Hybrid Peel-N-Stick Membrane Sealing Tape, 9" x 75' Rolls, with 4" Serration. 5 Rolls/Case. Price/Case. (shipping leadtime 2-3 days). 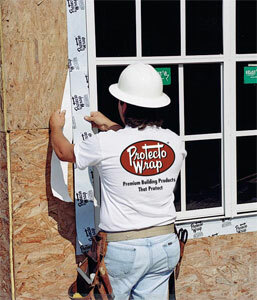 A state-of-the-art 25 mil window flashing tape. The custom film topping is specifically manufactured to Protecto Wrap specifications with the highest amount of UV inhibitors possible, giving BT25XL a 120 day exposure time. BT25XL also has an ant-thermaling additive in the film so it won't wrinkle when left exposed to the sun. BT25XL meets or exceeds all building codes including ASTM, AAMA, and ICC. ProtectoWrap waterproofing products meet or exceed waterproofing properties of sheet membranes or liquid coatings for almost any job such as floor, tile and roof underlayments, window and roof flashing and others.